The first part of the onboarding process is the induction, and to make the best impression on your new hire, you need to have a great induction kit. Without a great induction kit, new employees won’t be well equipped to start their job, and this can negatively impact productivity and staff retention. Your induction kit is not only your opportunity to make a good first impression, but it will also ensure your new hires settle in straight away and begin contributing to the growth of your organisation much sooner. A well-prepared induction kit will help new staff members to quickly understand your expectations and their new responsibilities. The induction kit should always include an introduction to your organisation and its key people – with a brief historical overview, mission statement and business plan; your workplace policies and procedures; workplace health and safety information; as well as a tour of the workplace. In a nutshell, it’s a collection of forms and information to be provided to your new hire to aid them through their induction and prepare them for starting their new job. Although this is all essential information, the process of bringing new employees up to speed should not end here. Providing your new hires with a good induction kit is only the beginning of a comprehensive onboarding process, which typically takes place within the first 3 – 6 months. Research has consistently shown that onboarding, when compared with traditional 1-day inductions, results in higher job satisfaction, greater employee commitment, and better performance results. This is largely to do with the shift in focus to the individual, and away from the ‘one size fits all approach.’ Onboarding starts with similar content to the traditional induction or orientation, but then moves beyond this to a personalised programme which is specifically tailored to the person and their new role. The onboarding process ends when the new hire is a fully competent and contributing employee generally measured through completion of the probation period and review.. 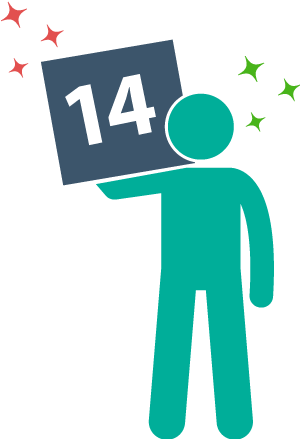 Here are the 14 essential elements of a great induction kit, but keep in mind that there may be additional things you wish to include, depending on the nature of your organisation and the specific role of your new hire. Learn more about this in our whitepaper. When preparing your employee induction kits, it’s important to think beyond the induction itself and view this as just one part of the entire onboarding process. The aim is to have your new employees transition seamlessly from one part of the process to the next, without any confusion or gaps in their learning. This is best done through an automated and personalised online induction software, which will ensure your well-planned, comprehensive and engaging induction makes a lasting and positive impression on your new hires. If you want to set up an effective onboarding process, download our complimentary whitepaper The Easy Guide to a Great Onboarding Process today. 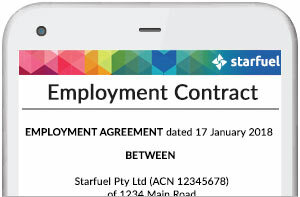 Automate employee and contractor inductions. Find out about research linking onboarding and employee success. 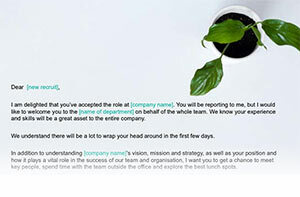 We’ve drafted a new employee welcome letter along with some tips on what you should include.